It's the country of pastry and chocolates and lots of baked goodies and somehow I managed to miss it. I'm talking about France of course. For some miraculous reason which I'm sure has something to do with pixies I haven't posted any of the lovely French pastry yet. I'm ashamed! So I'm going to be catching up really quickly now: starting with profiteroles, cream puffs and éclairs. With that I'll almost have half the French cuisine covered. I swear I'm not just going easy on myself! 1. Sift the flour with the salt in a bowl (omit salt when using salted butter). Lightly beat the egg in a smaller bowl. Set both aside, but keep within reach. 2. Melt the butter with the water in a pan over medium heat. 3. Add the flour to the melted butter and stir with a spoon. With the heat on medium to low, keep stirring while a big doughball forms. Continue to stir for 2-3 minutes while taking care to not let the dough cook to the sides, then take off the heat. Cool for about 2-3 minutes. 4. Add the eggs to the pan in 3-4 additions. The eggs will not seem to be able to mix with the doughball at first, but it will come together as you keep stirring. Eventually you will have something between a very thick batter and a very sticky dough that is very hard to stir (but you can do it!). 5. Put the dough into a piping bag and pipe lines onto your baking sheet for éclairs. You can also go for little balls for profiteroles or make around 6 big lumps for the famous Dutch 'Bossche Bollen'. 6. Leave in a preheated oven of 180 degrees Celsius or 360 degrees Fahrenheit for about 25-30 minutes. Once they are golden brown (and a skewer will drag the whole profiterole out of the oven, but will still come out clean when shaken vigorously), turn off the oven and leave them to cool on a rack before use. Let me teach you something about cream puffs. Cream puffs are also called profiteroles and are made of the same dough as éclairs. Both éclairs and profiteroles originate from France. 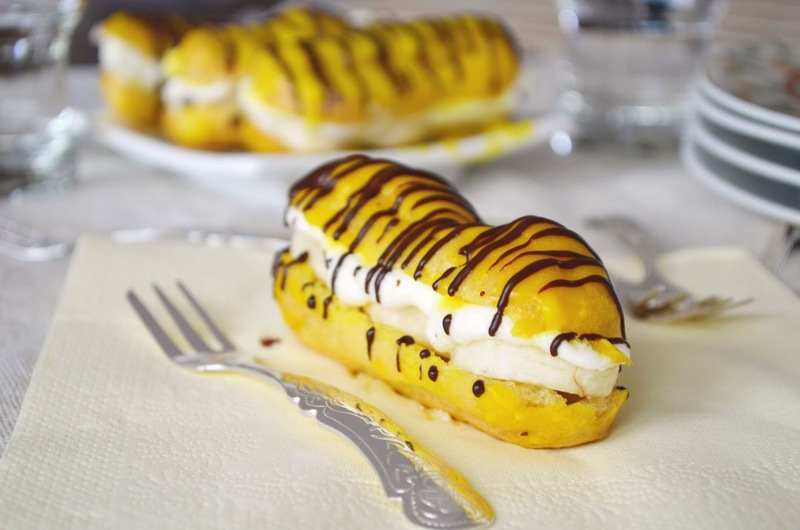 Éclairs are the long cream puffs while the profiteroles have the shape of little balls. 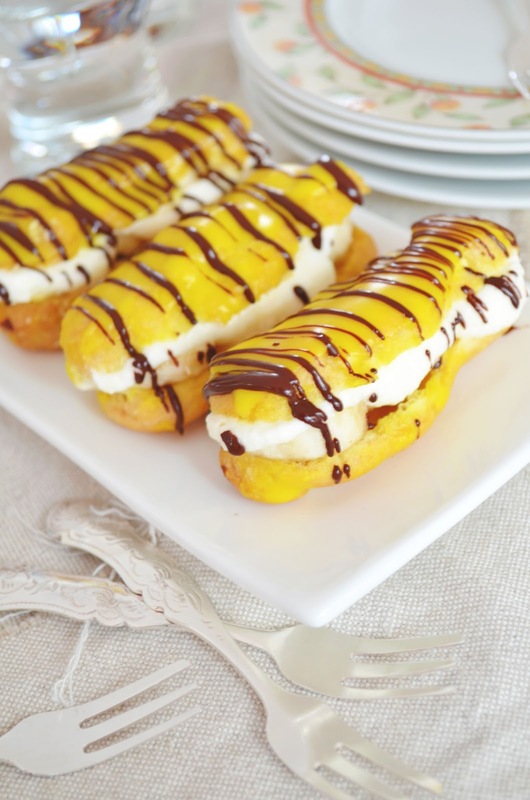 The Banana Cream Puffs (Bananensoezen) you see on the pictures however are a Dutch tradition. As are the Bossche Bollen I mentioned. To make a Bossche Bol: take one of the massive cream puffs, fill it up with cream through a hole in the bottom and dip it into chocolate. Chill before serving. Then watch people eat the massive cream puffs, which I can guarantee will be much more fun than making them! The Banana Cream Puffs need a little more work. 1. Start by cutting the cream puffs in half and lay the halves next to eachother on a baking sheet. 2. Make a glaze by adding food colouring (and/or water) to powdered sugar. Mix them together until you have a thick and spreadable consistency. How much powdered sugar you need will depends on the amount of creampuffs you want to decorate and how liquid your food colouring is. 2. Dip the top half of every cream puff into the glaze and place back on a baking sheet to dry. 4. Cut 2-3 banana's in equal slices and place them on the bottom half of every cream puff. 6. Put the cream in a piping bag and pipe a line of whipped cream onto the banana's. Do not make the layer too thick or it will squeeze out when you place the top on. 7. Place the top on. 8. Melt your chocolate and drizzle it over the banana cream puffs with a spoon. 9. Chill until the chocolate has set before serving. Despite the fact that these are very long recipes: they're quite easy to make. I also didn't think they took up an unreasonable amount of time. So don't let it put you down: it's just a lot of little steps to follow. Once you have all the ingredients lined up, you just have to put them together. Have your children help so they can get all the cream and sticky glaze and chocolate all over them. You can substitute with family or friends if you are short on children. 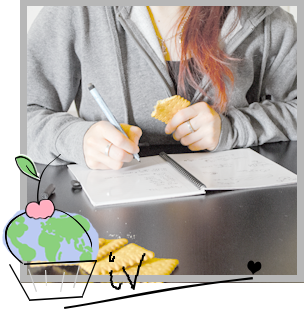 I hope you enjoy these French and Dutch recipes! Also: beware of pixies! Don't say I didn't warn you when suddenly all your éclairs or profiteroles are missing.